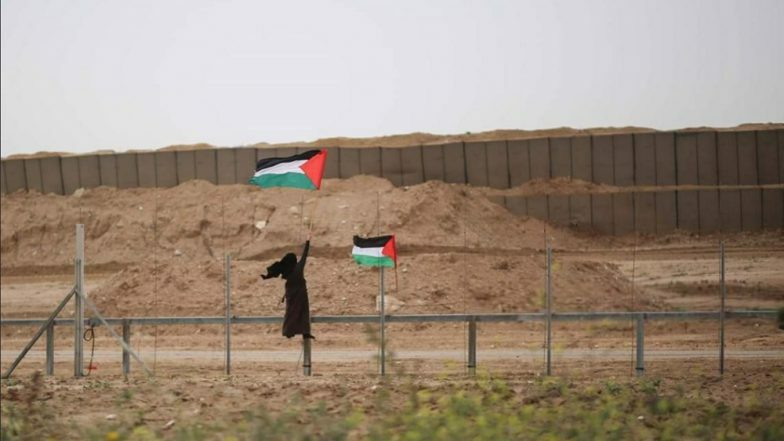 Toronto, April 1: Thousands of Palestinians congregated at the Gaza-Israel border to mark one year since they began the ‘The Great March of Return’ protests in the besieged enclave. Israel's army estimated that around 40,000 "rioters and demonstrators" had gathered in spots throughout the border. Four Palestinian youth were killed by Israeli gun-fire, according to Gaza’s Ministry of Health with over three hundred wounded. Israel’s military was deployed in full force along the border as the anniversary of the protest comes just days after Israel and Hamas have exchanged rockets and fire. The weekly protests called ‘The Great March of Return’, which demand the return of seized ancestral land to Palestinians has seen over two-hundred Palestinians killed by Israeli forces since March 2018. Senior Hamas official Bassem Naim called Saturday's protest "a very important message" that thousands had gathered "peacefully to raise their voice against aggression and the imposed siege on Gaza." Last month, a United Nations report on Israel’s actions against Gaza protesters, accused Israeli soldiers of intentionally firing on civilians and said these actions constitute war crimes. Meanwhile, leaders of various Arab countries held a meeting in Tunis, capital of Tunisia and renewed a call for a separate state of Palestine. The leaders also condemned US President Donald Trump’s move to recognise Israel’s sovereignty over the occupied Golan Heights. Saudi Arabia’s King Salman bin Abdulaziz Al Saud, in his opening speech said that his kingdom continues to support the cause for a Palestinian state in the occupied West Bank and the Gaza Strip, with occupied East Jerusalem as its capital. This as many believe that his son Crown Prince Mohammed bin Salman has softened the country’s stand over Palestine after intense lobbying by Jared Kushner, Trump’s son-in-law who also acts the U.S’s shadow secretary of state. Despite the strong showing at the summit, the Arab world continues to be roiled by protests and violence. Algeria and Sudan’s leaders were absent at the two have been facing intense protests calling for them to step down, while Syria was expelled from the grouping in 2011 after the brutal crackdown against protesters. Saudi Arabia and Qatar also remain at odds and hence their messaging on Palestine today likely holds very less weight in the international order.